Clients wanting a quick easy and delicious alternative to cooking themselves, can take advantage of our gourmet take away . 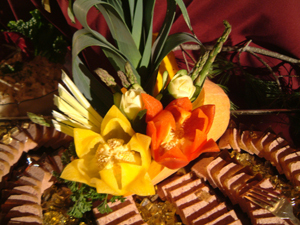 Most of Hors D'OEUVRES and menu featured on this site can be prepared in advance. Perfect for casual dinner with family and friends . Few canapés and party platters to go with cocktails, when you are too tired to cook .